How do I edit my domain's nameservers? This is a quick step-by-step walkthrough for changing your nameservers in the (mt) Media Temple Account Center. Nameservers are responsible for resolving, a special process in which a domain name matching your website is taken and a physical address is obtained. Learn more about DNS. This tool is only available for a domain that has been registered through (mt) Media Temple. For more information on registering a new domain, please see: How do I register a new domain? For instructions on transferring your registration to (mt) Media Temple, please see: How do I transfer my domain registration to or from (mt) Media Temple? From the DOMAINS tab, select the domain you want to edit. 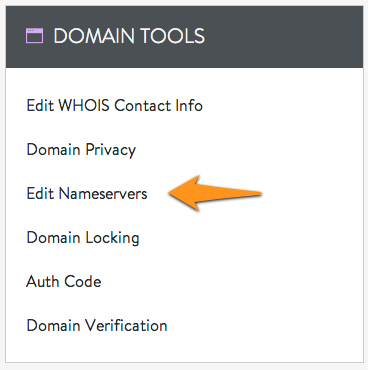 In the DOMAIN TOOLS panel, click on Edit Nameservers. Enter your desired nameservers. You must have at least two. The (mt) Media Temple nameservers are NS1.MEDIATEMPLE.NET and NS2.MEDIATEMPLE.NET.